We believe that this article, despite its somewhat “academic” form and its “objectivist” style (multiple journalistic references that are supposed to give it a veneer of “seriousness”), compiles and synthesizes a whole series of important information and readings. It also represents a great relevance for many militant discussions at the international level on recent evolution of the politico-military front of the “civil war in Syria” and the very media “war on terror” and “against the Islamic State” in particular. So far, we have neither the force nor the time and the militant energy to translate the whole text in English, Czech or Spanish (for example). Nevertheless we want to affirm here our fierce desire to centralize any initiative coming from comrades able to take on with us this task of translation in these or other languages. We are therefore issuing an appeal and we are already proposing the translation into several languages of a small excerpt from this text. It is more specifically focusing on the critics of the illusions towards the so-called “Rojava Revolution” and its politico-military structures always more heavily integrated into state military systems: weapons supplied by the US, coordination of military campaigns with the US, Russia and Syria, construction of US military bases, presence of Western special forces troops within the coordination of Rojavist militias, etc. Even the last admirers of Rojava’s “libertarian utopia” in Western far-left circles must recognize “the state aspect” of this “experience”, its “proto-state institutions”, the weight of the PYD, the compulsory military service, the leader cult, the respect for private property, etc. They still hope that with time the situation can develop positively. In the meantime it is talked a lot about the communes that the PYD sets up in villages and neighborhoods. Yet, far from the workers’ councils, they are mainly district councils with limited and consultative powers, and with the role of first instance judicial mediators. The rest of the political and administrative functioning, which seems to be very bureaucratic, is modeled on the Western democratic institutions – which, it is true, is a novelty in Syria. 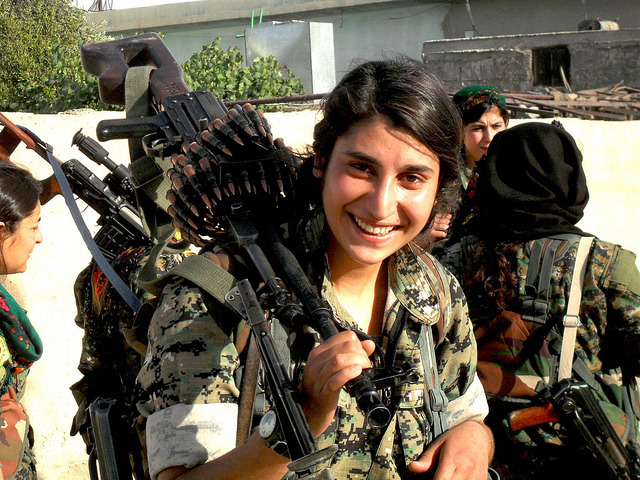 The regime in power in Rojava also announces a “will to defend a form of organization of society that respects gender equality and linguistic diversity” and “a fraternal, democratic, ecological and emancipatory society for all without distinction of gender, ethnicity or faith”. This is very good, as it is for the establishment of gender equality in all areas. But isn’t it a little exaggerated to call these principles “revolutionary”? And when it’s said “for patriarchal societies”, should we understand “for these people”? Because we do not see very well how could “revolutionaries” support and praise such a process, unless they believe in a kind of an Orientalist reverse momentum, that it is very good for them, or they think (perhaps following recent theoretical discoveries) that the establishment of a parliamentary democracy based on the Western model is now an indispensable step for a future social revolution. If it was possible to be mistaken in 2014, it is incomprehensible that in 2017 some people still discover in Rojava a “revolutionary”, “libertarian” or even “self-managing” experience. We won’t come back to that. The word “revolution” has been widely overused in everyday language, to such a point that it has no longer any precise political meaning. It seems that it is now the same in far-left or anarchist circles, where this word is increasingly synonymous with evolution towards more democracy. In addition to losing battles, if we lose words, it’s utopia itself that is weakened.